Keep your eye on the prize and run to win! That was Paul's charge to the Corinthians in pursuing the call of God upon their lives. Knowing their love of sports, he told them they should run with the same determination, discipline, and focus that they would use to win the prize in the Isthmian games held in Corinth. Paul's appeal to these qualities in the pursuit of what should be our ultimate goal, living life by God's design, only serves to underscore the importance of these characteristics to success in any undertaking that is worth pursuing. In America today, determination, discipline, and focus are also what is required to continue on our current path of restoring the core values that built a great and prosperous country. In particular, we have seen the end to eight years of a withering assault on religious freedom, an issue that motivated voters in the 2016 election. A clarion call to respect people of faith and our First Freedom -- religious liberty -- could not come at a better time as we mourn as a nation the loss of life in Pittsburgh where a man allegedly motivated by hatred against Jewish people committed an act of violence. That barbarism illustrates why respect for people of faith and protection of religious liberty is so important, especially after years of marginalization by the last administration. The anti-faith attacks could be seen most clearly in our own government prosecuting nuns, who were aiding the least of these, for refusing to violate their religious beliefs and fund contraceptives, including abortifacients, in their health care plans. There were also the cases of Soldiers, Airmen, Coastguardsmen and Marines punished for seeking to live out their religious faith in the most basic ways, like having a Bible on their desk or chaplains like Wes Modder being removed from his command for counseling according to the principles of his biblical faith. We witnessed small business owners like Don Vander Boon, whose family owns a meat packing facility in Michigan, told by agents of the federal government that he had to remove Bible-based articles from his breakroom where employees gathered, or the government would shut their business down. But stopping this prejudice is only the first step to righting our course. It will take a concerted and consistent effort to rebuild respect for America's First Freedom throughout the ranks of a government, which the previous administration had mobilized to attack. Less than two years in office, the Trump administration is restoring religious liberty. In May of 2017, President Trump issued an executive order directing the Department of Justice to ensure all federal agencies were protecting and promoting religious freedom. Despite tremendous opposition from leftist groups that are suing the DOJ and other agencies to hinder or stop the effort, the restoration of our First Freedom continues. For the first time in a long time, religious freedom has also become a priority in U.S. foreign policy, most notably demonstrated in Secretary of State Mike Pompeo. Just three months into his post, he hosted the first-ever Ministerial to Advance Religious Freedom, attended by leaders from over 80 different nations. It is essential to each individual American, especially to Christians who are called to follow the teaching of Scripture no matter what they do: "whether eating or drinking, do all to the glory of God." This understanding that religious freedom is the ability to live every aspect of our lives according to our faith is deeply rooted in what historians describe as America's Protestant work ethic, which has led to unparalleled productivity and prosperity, as work is an act of worship done in service to God. French historian Alexis De Tocqueville, in his historical analysis of America's growing prosperity in the 1800's, made clear that the foundation and anchor for democracy and prosperity in America was the Christian faith pioneered by the Puritans. 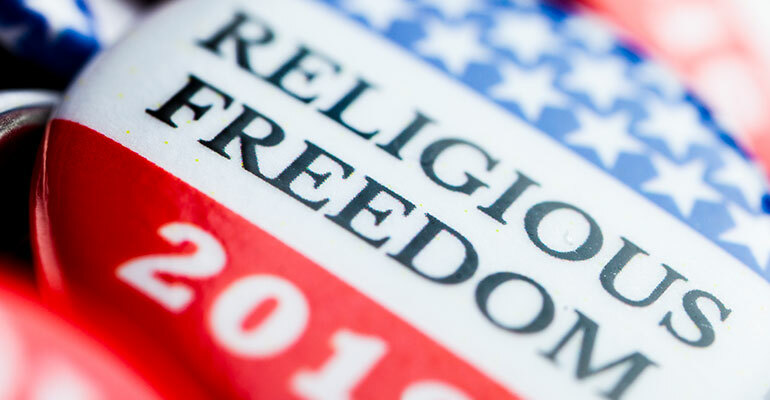 In other words, America didn't create religious freedom; religious freedom created America. Many will be quick to try and dismiss the connection between religious freedom, economic prosperity and social stability, but a growing body of academic research shows the correlation. Indeed, a study by the Religious Freedom and Business Foundation reports that "religion contributes $1.2 trillion to the U.S. economy annually, more than the combined revenues of the top 10 technology U.S. companies including Apple, Amazon and Google." Is it a coincidence that as religious freedom is being promoted and protected again in America, our economy is growing and unemployment is shrinking to historic lows? Maybe, but economic growth and prosperity cannot be long sustained without religious freedom. And for religious freedom to impact the economy, it has to be an individual freedom that permeates all aspects of society. The mere freedom of worship, which seeks to quarantine the practice of one's faith within the walls of a church, is not authentic religious freedom. The Trump administration has done more to restore religious freedom than any other administration since the steady assault began over a half century ago. This election is about whether or not we continue on a path that restores America's First Freedom, which is foundational to genuinely making America great again. We must be disciplined in systematically pursuing those policies that will restore religious freedom and stay focused on the prize -- one nation under God with liberty and justice for all. For more motivation heading into Tuesday, check out this op-ed by FRC's Patrina Mosley and David Closson, "For Christians, Voting Is Not an Option. It's a Divine Calling." If Christians are as fired up as the packed house at last night's simulcast in Woodland Park, Colorado, then this election might shatter everyone's expectations. 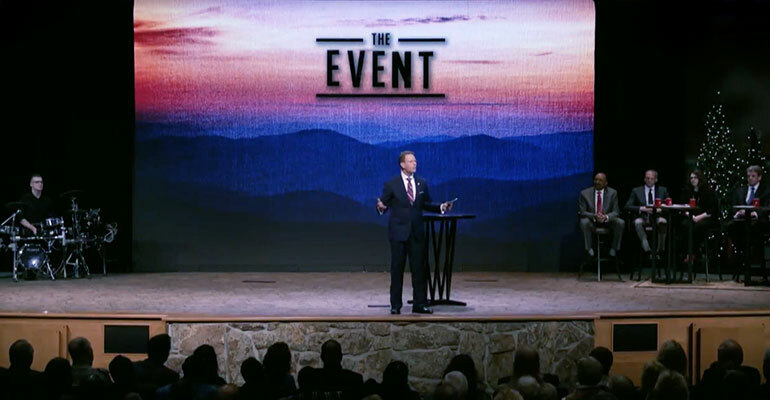 Along with Andrew Wommack, I had the opportunity to co-host "The Event" on Sunday night at Charis Bible College, and the response was absolutely overwhelming. 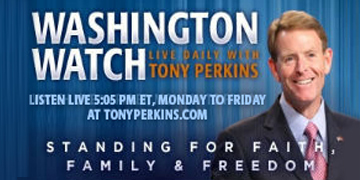 We were there, as many of you who tuned in know, to challenge voters to pray, vote, and stand for a strong America. And based on the response last night, a lot of you have already gotten a good head start. Together with Governor Mike Huckabee, Students for Life President Kristan Hawkins, ADF, Mike Farris, E.W. Jackson, and many more, we made the closing argument before Tuesday's election that voting is not just a right -- it's a responsibility. "... Jesus never ever expected that righteousness would come from the civil government. He never expected that the culture would be mostly influenced by the politicians. Today, I don't believe God is looking at New York, Hollywood, or Washington as the centerpiece for the awakening and revival that we desperately need in this country. I think he's looking at Christians in the churches. And he's saying, 'They're not the salt -- you are! Be the salt!' But how can you be the salt if you don't vote, if you don't pray, or if you don't stand?" I encourage you to take the time to listen Governor Huckabee -- and all of the powerful speakers -- about what can change in this country if Christians had the courage to be the salt Jesus called us to be. There are a lot of things that Brett Kavanaugh looked forward to when he became a Supreme Court justice – like the ceremonial walk down the steps after his investiture ceremony. But, like so many of the celebrations surrounding his confirmation, Democrats managed to ruin this one too. There are just too many "security concerns," a court spokesperson said, for the new justice to keep the tradition. It's one in a long line of happy memories the Kavanaughs have had to sacrifice after the viciousness of the Left. Now, more than a month after Senate Democrats tried to destroy his life over bogus sexual allegations, one of his accusers is admitting what Kavanaugh insisted all along: she made it all up. In a bombshell revelation that should be on every front page in America, Judy Munro-Leighton confessed that she "just wanted to get attention." Well, she got the media's. Her phony story helped feed the hysterical headline that the president's Supreme Court pick was a drunken monster who preyed on women. The allegation got the press's undivided attention, despite the fact that it -- like every other account -- didn't have a corroborating leg to stand on. And of course, now that she's confessed, much of the media is nowhere to be found. It's an inconvenient reminder the day before a midterm election that Democrats used people like Munro-Leighton to try to destroy an innocent man. "It's despicable," Fox News's Greg Gutfield points out, "how much press that the allegation got, versus the press it isn't getting now -- once it's debunked." Liberals didn't mind using Munro-Leighton to build their sham case against Brett Kavanaugh, but now that she's admitted it's was "false, a 'ploy,' and a 'tactic,'" they have no interest in the truth -- or in clearing the justice's name. Fortunately, Senate Judiciary Chairman Chuck Grassley (R-Iowa) insisted the investigation wasn't over when Kavanaugh's confirmation was. Under his leadership, the committee dug deeper -- 414 pages' worth -- into the accusers' claim. In a letter to the FBI and Justice Department, Grassley talks about the extensive investigation that included interviewing more than 40 people "including classmates and friends of all those involved. 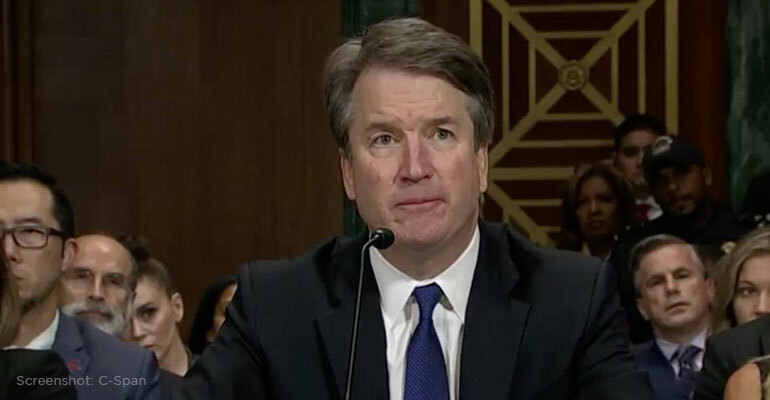 Committee investigators found no witness who could provide any verifiable evidence to support any of the allegations brought against Justice Kavanaugh... [T]here was no evidence to substantiate any of the claims of sexual assault made against Justice Kavanaugh." Munro-Leighton's testimony, which is partially included in the report, is astounding. Asked if she'd ever even met Brett Kavanaugh, she told officials, "Oh Lord, no." "I was angry." And now, so are conservatives. "A vicious accuser of Justice Kavanaugh has just admitted that she was lying, her story was totally made up, or FAKE!" the president tweeted. "Can you imagine if he didn't become a Justice of the Supreme Court because of her disgusting false statements. What about the others? Where are the Dems on this?" If Senate Democrats were as interested in justice as they claimed to be September 27, they should be leading the call for Munro-Leighton's prosecution -- along with fellow faker Julie Swetnick and her attorney, Michael Avenatti. Instead, they want Americans to think you can do anything to disrupt the president's agenda and get away with it. Thanks to Senator Grassley, people may start thinking twice before they try to sabotage an innocent man. Munro-Leighton should be prosecuted, the Wall Street Journal editors insist -- not just for the damage she's done -- but to "deter other attention-getters who think they can make false accusations to stoke a political mob in the media and U.S. Senate." Brett Kavanaugh and his family are still living through the fallout of that horrible month. Nothing will ever undo what happened to him -- and what they lost because of it. But you can do something that will help protect other men and women from the same nightmare: Vote.